Hello everyone! You didn't wake up on the wrong day. It is really Thursday. I had major Internet provider issues over the last few days and wasn't able to get my Wednesday post up in time. So here it is, a day late but hopefully filled with useful information. My contribution to Writer's Words of Wisdom this week is to continue on the same topic of setting up and personalizing your blogs. In fact, I'll be travelling down this road for the next several weeks and hopefully will cover some of the topics people have been asking me about over the last few months. 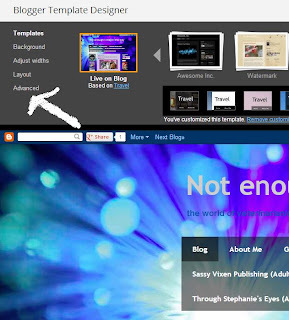 I've had more than a few requests to discuss a bit about setting up the layout of my blogs. Mainly, folks want to know how I did it. Well, there really isn't a right or wrong way to go about doing it. All of my blogs are fluid—constant works in progress. I'm always fiddling with the layouts and order of things to get all of them to be appealing to the eye. I like to change up the color schemes too. 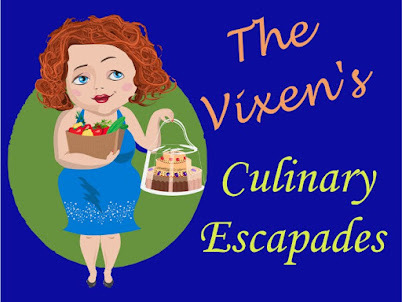 Right now, I'm only working with the free themes offered through Blogger and Wordpress so some of the layouts are restricted by the specific themes that I choose to work with at the time. This is most evident with Wordpress. The fonts, colors and layouts are all locked in with their free themes. However, I can choose at anytime to upgrade and pay to customize them. That's a future goal for me. 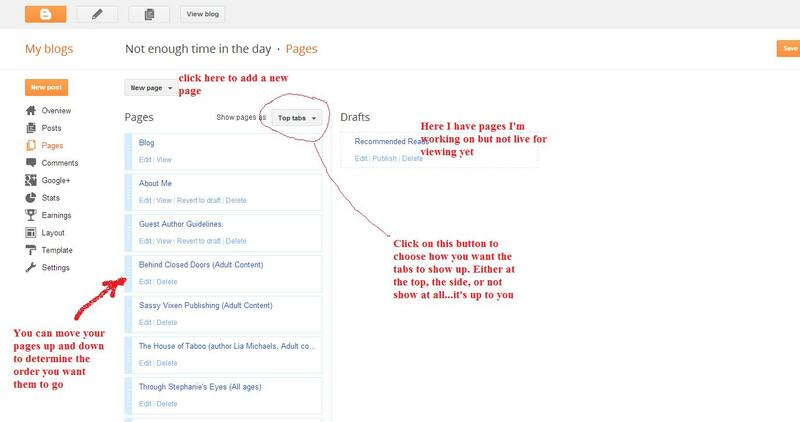 Clicking on the "TEMPLATE" option on the menu on the left side will show the "CUSTOMIZE" button. Click on that to take you to the next step. As you can see, I'm using this blog to help demonstrate what to do here. 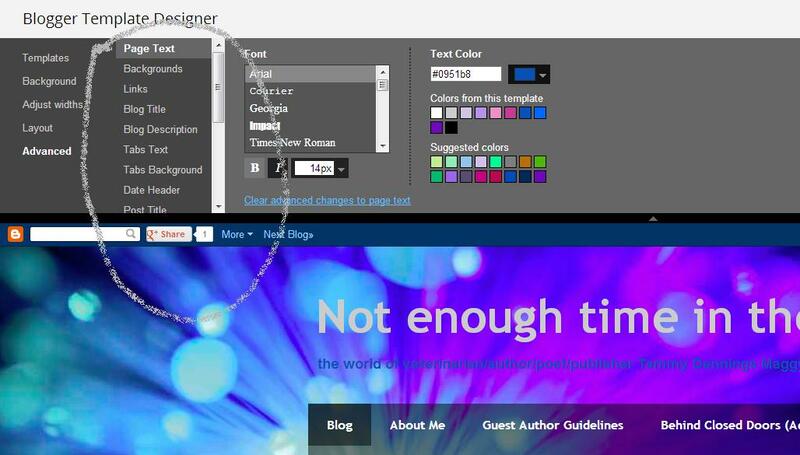 Of course your own blog won't have the same colors and layout as mine...or it could if you chose the same theme. LOL On the left side you will see another menu list. Click on the last option "ADVANDED." This will take you to the window where you can change fonts sizes, colors and everything to give your page the look you wish to have. Here's what mine looks like at that step. Notice the area I drew a circle around? That is the list of options you get to control. When you click on each one, the choices of fonts and colors open up for you on the right. Currently it's showing what I can do for my page text. 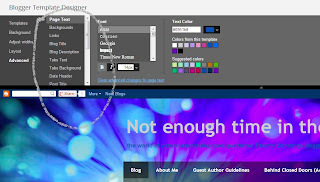 Blogger gives you suggestions of what colors will go with your chosen theme or you can go completely in another direction. It's up to you. Go ahead and play around with all of the spots you wish to customize. 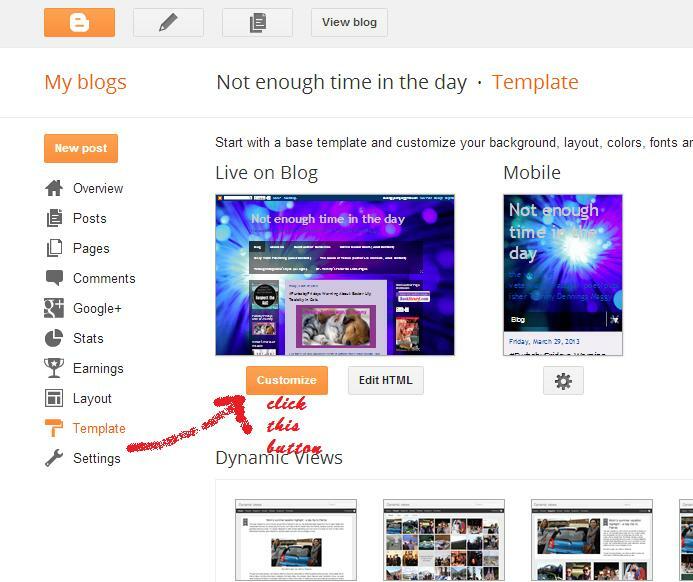 Make sure you save your arrangements before you change screens to view the blog. If you don't like how it looks, or a font color isn't showing up the way you want it to, then change it. Once you've played around with the theme and all it has to offer you, I'd like to touch on one more thing before I go for the week. 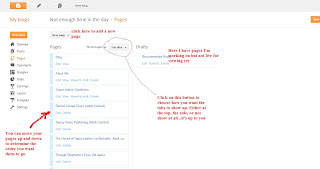 This is how to set up your navigation tabs. Most folks have them at the top, like I have but some people like them as a side bar. It's up to you. How do you get to add tabs? Well, those are called "PAGES." 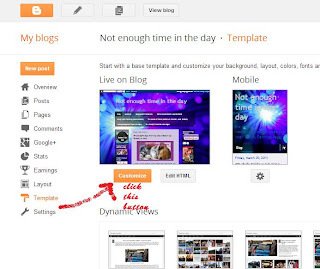 These can actually be stand alone/static pages you create or links to different blogs or websites. Click on "DESIGN" at the top of your blog again and then pick the "PAGES" option on the left side. It should take you to a page that looks like this. I've added a few notes in the photo above to let you know what each section does. First thing, just add the links and pages in any order. You can change that up at any point by clicking on the little light teal/blue colored shaded area of each entry and arranging them in the order you wish. This is just like on the layout page. We'll get to setting up the layout on another day. For now, let's just concentrate on how you want your navigation tab bar to look like. What links do you want to put there? One very important one would be to your website if you have one. What you put there is all up to you. There really aren't any rules here. I hope this week's mini seminar was helpful. If you have any questions at all, or would like to see how to so do something else, let me know. I stuck with Blogger for this post, because it does have so many different ways to change things up and still for free. For those of us just starting out, free is definitely an added BONUS! For more Words of Wisdom, please check out the other authors participating this week. 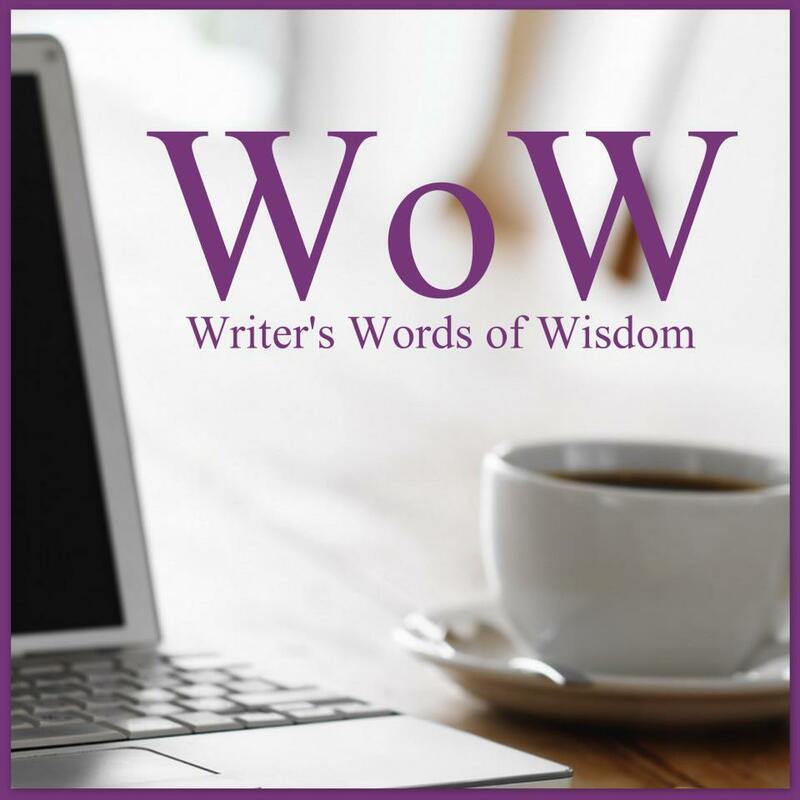 Make sure you come back next Wednesday when I talk more about creating static pages and how to use them for hops, promotions and keeping your first chapters available only to those who click on the links you provide. Intrigued? Come back next week! 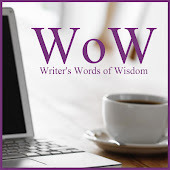 Coming soon is our own website to host our weekly Writer's Words of Wisdom. Stay tuned for details!